Canon 7D and manual lenses. 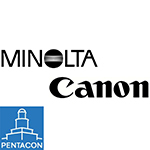 Posted: Fri Jan 17, 2014 10:04 am Post subject: Canon 7D and manual lenses. This issue has been puzzling me for the past twelve months, in fact since I "upgraded" from a Canon 450D to a 7D in December 2012. I had used my 450D for a number of years using various makes of M42 fit lenses, i.e. Zeiss, Helios and Vivitar. Although I say it myself, I thought most of the results were very good. However, since I started using the 7D, I find my results at best OK, but nothing really stands out and compares with my previous images using the 450D. I have tried using the same, or similar settings as used with the old body, but am getting really frustrated with the results. Are there any other 7D owners who have experienced anything similar? I like the 7D when using my auto focus lenses, but sadly with manual lenses the results are not very good. I was thinking of getting a used Sony Nex, (or similar) for my M42 and FD lenses. I had a EOS 7D for several months before the 5DII, and I found the 7D better in many aspects - the dream camera for me would be a 7D with a FF sensor! What the issues you're having with the 7D? i do have 7D and absolutely no problems with m42 lenses and deliver great results, maybe it's a problem with adapter? Have you got it with AF chip confirmation? Maybe u misfocus those shots ? Thanks guys for your replies. I always shoot raw, so any in-camera settings would be irrelevant. With manual lenses I always us AV, or manual and use the histogram for exposure, but still my out of camera images are not as good as with the old 450D. I find myself doing far more post processing to achieve satisfactory results. I use both chipped and un-chipped adapters with live view on a tripod, but still not getting the IQ and colour/contrast as with the 450D. As I said in my earlier post, my Canon and Sigma auto lenses return superb images, but alas, the manual lenses are not as good as with the old 450D, which regrettably I sold to help fund the 7D purchase. I know that the 7D does have quite a strong AA filter, which at first I thought could be contributing to my problem, but you guys are all saying that you have no such issues, so that can't be the problem. I also don't believe that it is user error, I have been using manual lenses since 1982 and still use some FD lenses on my Canon T90, in fact, I still use a Canon FD 100mm macro on my 7D using an adapter with the glass removed, which does give some great results, but using that combo does take a lot of thought and preparation, plus a lot of deleted images to get what I want. I had a similar impression some years ago when I "upgraded" from the 350D to the 40D. Although the 40D was a much better camera and the results with AF lenses were great, I never got rid of the impression that the results with manual lenses were better on the 350D. It might have been subjective though and influenced by the first amazement when you dicscover that you can shoot with manual lenses. You might put much more "soul" into it. I don't know. I use both chipped and un-chipped adapters with live view on a tripod, but still not getting the IQ and colour/contrast as with the 450D. As I said in my earlier post, my Canon and Sigma auto lenses return superb images, but alas, the manual lenses are not as good as with the old 450D, which regrettably I sold to help fund the 7D purchase. Nice post. I learn something totally new and challenging on websites I stumbleupon every day. Out of interest, what editing software do you use? And is your monitor calibrated? If you are pixel-peeping to determine IQ differences, remember 7D pixels are smaller, thus IQ will be less than when pixel-peeping 450D images. You say you shoot raw, and then complain that "out of camera (7D) images are not as good as the old 450D."?! I will assume by "out of camera" you mean 7D and 450D raw images are developed using identical software settings, including white balance? This could very well be caused by different AA filter which requires a different unsharp setting for optimal pp sharpness. Color and contrast difference could be due to differing white balance settings.